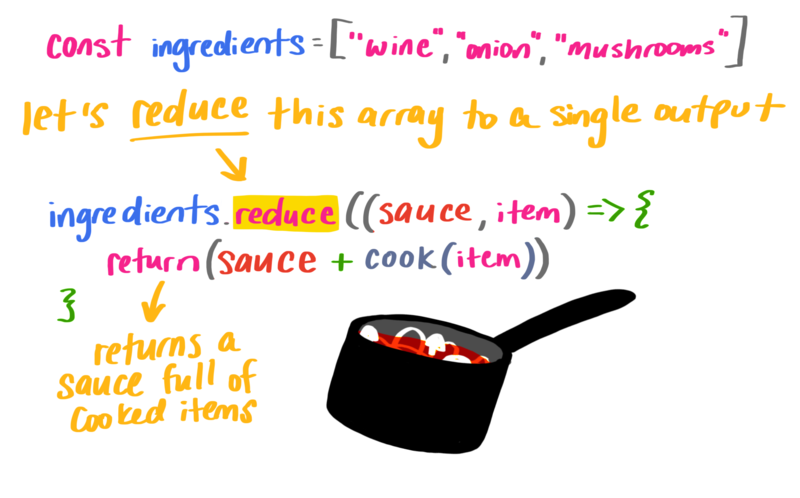 However, there is no need to use += here, since the next call to the lambda will not use the same sauce, but will use the return value as its sauce. Using + is enough. 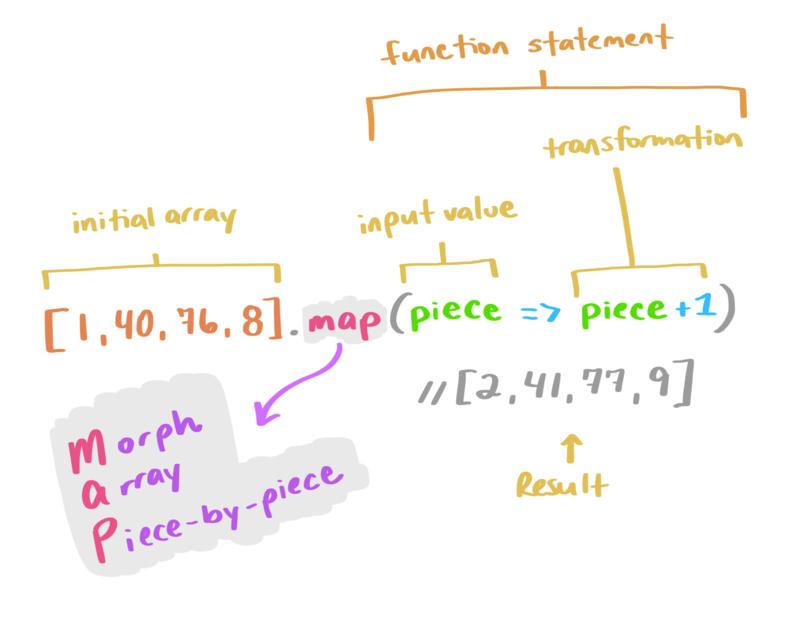 += is also very much not in the functional style of map/filter/reduce since it mutates sauce (even though it’s just a local variable). I love the article and the song. I will use the 3 now. Can I contribute one small fix in the first reduce example. Very nice article. 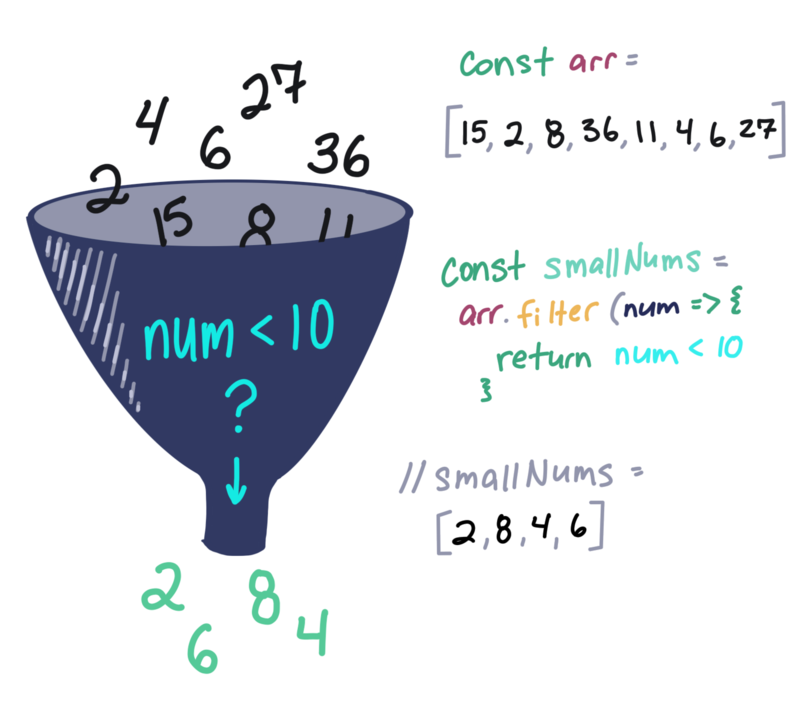 Those three functions (methods) are very useful and it’d be great if more people knew about them. It doesn’t add a comma before the first argument because it doesn’t call the function for the first argument at all, instead starting with the second and passing the first one as the accumulator. Nice article and song! But reduce example seemed overcomplicated to me, it’s easier to get the separated cooked food with commas using join(", "). Great article, but I think you glossed over an important detail about reduce(): if the initialValue parameter is not supplied, it defaults to the first element in the source array. You showed this in your output comment, but didn’t explain it exactly (you just said it would make the output “wonky”). This was really well explained, thank you. I got lost on the reduce section but the .map and .filter made those so much simpler than I have had them explained in the past. Really nice presentation, but a couple things. 1) Your wording on map makes it sound like the initial array is getting mutated, but it’s not. 2) Your initial snippet for reduce is incorrect. Your initial value should be inside the parens. other minor issues have already been mentioned by Aron. Also of note, return is optional.